The Masters Degree Programmes are available in Full & Part-time modes. All modules follow the intensive delivery pattern with at least a one week break between modules. You may start the research module once you have completed 5 modules. Having completed the research module you may start your dissertation. Attendance at all sessions and completion of the examination and assignments is compulsory. 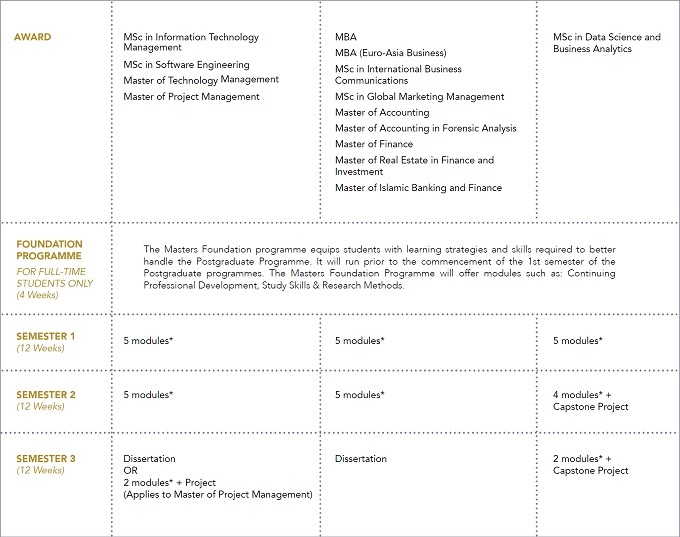 The Masters Foundation Programme aims to enable students to acclimatise to the Masters nature of their studies. This is to ensure that students are equipped with a new set of learning strategies and skills required to better handle the Postgraduate Programme.